I received an interesting question from a reader recently, interesting because it’s something that I’m sure is often discussed in writers' groups, but not anything I’ve ever really thought of. . . . I've had an ongoing discussion with some writer friends about adverbs and dialog tags other than "said," and I'd like a professional agent's opinion. I've read just about every book on writing, and if they address the topic, they say not to use adverbs ever, and that "said" or "asked" is sufficient (no shouted, yelled, whispered, groaned, commanded, etc.). But I also read published books that have their characters "whispering" and "grunting" and "saying questioningly" with abandon. A lot of published books use mostly said and asked, but an equal number do not. So here's my question: Is there a real "rule" in the publishing world against descriptive dialog tags, or is that just something authors of writing books tell writers to get us to buy more books on how to make our writing more descriptive using nouns and strong verbs? Has an editor ever told you they liked a book, but they were passing because there were too many adverbs? My simple answer is “no,” there’s no real rule about dialogue tags. At least no rule I’ve heard of. I suspect that the concern about dialogue tags isn’t so much about there being a rule but about how writers could easily use dialogue tags as a cop-out. For example, by saying that your character “grunted” you don’t need to show the character actually doing the labor or feeling the pain. It’s a lot easier to use one word than it is to write an entire paragraph describing why the character might grunt later. I think dialogue tags could actually add a lot to the story if used carefully and properly. They should never interrupt the flow of the story or become a distraction to the reader and they should never be used in place of showing versus telling the story. If your character is going to whisper we need to see very clearly why she is whispering before it even happens. This is the main thing to consider when choosing dialogue tags, in my opinion. Writing books tell us "said" is usually the best choice because other words can interrupt the flow of the story and become distracting. I've critiqued work where the author bent over backward to avoid using the word "said," and it was definitely distracting. "He spoke out," "She stated," "He articulated".... If the word "said" will suffice, why not use it? It's only when other dialogue tags don't fit in with the writing that it become an issue in my mind. I'm a strong believer in said and said alone. In fact, I never even used asked; the question mark is all that's needed, IMHO, to indicate a question is being asked. For me, the major issue is not interruption of flow; rather, I think ornate dialog tags are used to mask lazy writing. I agree with anonymous...the only other tag I might use sparingly would be 'whispered.' If it was very important to what was going on in the book. But I truly despise books that use the 'adverb + fancy dialog tag' combo. So distracting. Takes me right out of the book as I try to imagine how someone could "beg imploringly" or "command triumphantly." UGH. To me, it is lazy writing. I'm a big believer in the Power of Said as well, but...I think often novice writers use extravagant dialogue tags because they think (I emphasize: think) it's good writing. Only with experience and feedback does one learn that in the case of he said/she said -- that it's enough. So I don't believe it's lazy writing - I think it's uniformed writing. I'll often use excessive adverbs when quickly drafting a scene or chapter. That way, it's an indicator of where I want to go back and flesh things out. Every word has its place - and use - imo! I am a truly beginner writer and I struggle to keep it to only said or asked. Not sure where I ever "heard" the rule, but it's stuck with me. It is very difficult for a new writer because it sounds so repetitive and on the flip side, too easy. I think that's why ornate dialogue tags are sometimes rampant in novice writings. Not that the writing is necessarily lazy, but more of a geniuine attempt to embellish in some way. Amy, I just picked up a fabulous tip from you---use of excessive adverbs when quickly drafting a scene or chapter and use them as "markers" later!. Thx. Like anything else in writing, I think good tags can be used sparingly. If every tag is out-of-the-way creative, it becomes very noticeable and distracting. But once in a while, when it adds to the mood or describes perfectly how something is said, it isn't distracting. Similes are the same. As are adverbs. Done sparingly, in the right place, they are fine. Even Stephen King, who rails loudly against adverbs, admits there are some he just can't bear to cut. Alcohol. Desserts. Adverbs. Tags. It's all about the moderation. I try not to use dialogue tags of any kind, including said. Character actions and facial expressions are usually enough to indicate who's talking. I strip out most tags during the editing stage of a draft. I hate the word said being overused in a book. Like all words, it's good, but if you use it to much it becomes annoyingly repetitive. I hate looking at a page and seeing a long string of "saids"
Rather than overuse "said" or DL tags I prefer when an author uses few DL tags and fills in spaces between the DL with actions, feelings, or internal thoughts. Unless the character isn't moving at all during the conversation (very rare) there should be some movement associated with the comment that would serve better than "he said/she said"
I interviewed Elmore Leonard for an article a few years ago, and out of all the things talked about -- during his general lecture and my interview itself -- this particular topic sticks with me most. He was adamant about using ONLY the word "said" when writing dialogue, and repeated the rule (for him, anyway) several times. Just one man's opinion, but very interesting...especially when you consider the source. Dialogue tags don't usually faze me except for "she hissed". I always, always stop reading and look back to see if the dialogue had enough 's's to warrant a hissing sound. I hate it when there's not an 's' in the dialogue. Jenny Crusie uses tags and they don't inturrupt the flow, matter of fact, I think they KEEP the flow. But she is who she is, and they're a part of her voice. I think in her case they add-but she's one of the only writers who I like tags from. And she uses Said more. I vote for a mix of nothing at all (especially when the dialogue is fairly quick and back-and-forth), "said," and (as just_me said) dialogue interleaved with action. Somebody mentioned how obsessed they become by many appearances of the word "said" on the page. I'm with them, too. OTOH I think these kinds of obsessions are transient and a little bit, umm, twitchy. Hey, I blogged on this not long ago about dialog tags and then about writing accents and stuttering -- I agree that there's no hard and fast rule, there's just a lot of good advice you have to apply to the situation how you see fit. I do what Karen does. In fact, when I'm writing a brand new section of dialouge, all my characters are either nodding or shrugging--I see them as little bobble head dolls. I rarely use he said/he asked. When I come across them in a story, nothing rips me out faster than some great line ended with the plain and boring, "she said". He whispered, "Are we eating squirrel or frog legs?" I think it's amazing how strident opinions can be over "the rules". Not using dialogue tags can be just as annoying as repeatedly using said or none at all. It depends on what words are used and how they complement the story. There are no hard and fast rules in writing, so the books go for the middle ground, their writers aiming to correct the maximum number of mistakes at a single sweep. Thus you see "never use an adverb," "eliminate all instances of the verb to be" and "there's no need for the word that." All too often writers, afraid to have no dialog tags or afraid of overusing "said," will go for something that just doesn't work. Someone mentioned "hissed" if the words involved don't have S-sounds. My least favorite is "laughed." You're laughing or speaking, but you're not speaking in full sentences and laughing at the same time. (Here I refer to constructions like "these words," he laughed, "can't be spoken because I am laughing." That construction is very different from: "These words can't be spoken." He laughed at the very idea of their pronunciation. Physical actions can often substitute for dialog tags, though you have to be careful they don't clutter the scene too much. But, of course, everything you see in these comments comes with a caveat...there's a reason for what those books and writing teachers say. The vast majority of people overuse attribution tags, dragging readers out of the story. Since it's such a common fault, it behooves writers--all of us--to study every tag with care, to deliberate on its inclusion, and to question its necessity. And then, if it belongs, leave it alone. This debate was settled for me once and for all when my favorite author, Neil Gaiman, came down on the "Said" side. He's one of the best living writers there is to me and if he doesn't dig on the dialogue tags, well, I'll follow his lead. Now I try to avoid tags if I don't think it's confusing to the reader to go without. I also really like tagging with action. Why throw said in there at all if you don't need to? I am a novice writer and am struggling a bit with this issue. However, I read a lot, and I hate it when I get lost on who is actually doing the talking. I like tags and said is probably my favorite. I hardly notice it when reading, but I always know who is doing the talking. I don't mind asked, whispered or any other identifier that helps paint the picture with what is actually going on. In my opinion under use of tags is much worse than over use. I do whatever makes my writing the best. Which means no rules. I want it to read and flow well. To me, when I read, I can always pick out writers who are adhering to those 'rules' so stringently. 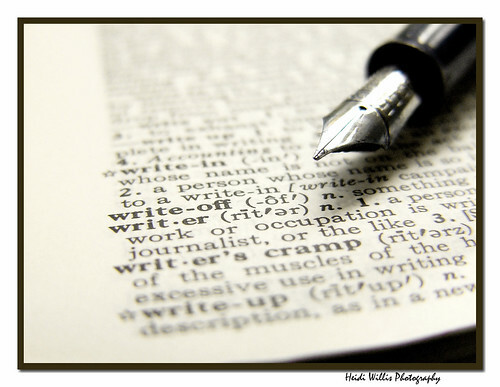 Adverbs, dialogue tags, said, they were all created to be used. It's just how you use 'em. Great post. This subject has come up in every writer's group I've ever visited. You will need to use some sort of tags, especially when you have a three-way or group conversation. If not, life gets too confusing. I think this post and the comments show that we all have little pet peeves about what bugs us about books. The words he said or she said can often be used as a little pause. They give the mind a split second break in dialogue and can thus slow down rapid fire pacing. Is pretty darn quick. A verbal fight or fast dialogue often won't have any tags. "I love you." She chewed on her lower lip as she waited for him to reply. It felt like eternity before he said, "Me too." Tags and attributions create very subconscious pauses for the reader. Read your dialogue aloud to help you see if you need a tag or not. As a reader, I get tired of said, said, said over and over again. I want some variety in the speaker tags. An occasional adverb or "stronger verb" other than said helps to break things up, and convey nuances of story. So I tend to write the kind of stuff I like to read. I add enough tags so people know easily who is talking. I use said most of the time, but I vary it also. In one critique someone pointed out I used an adverb. My gut reaction was to say, "Yes, it is an adverb." I get rather tired of the die hards who obsess about no tags, no tags other than said, no adverbs, no passive verbs, no whatever. It all depends on how it's used and moderation seems to be a good rule if writers absolutely insist on rules. Michele, good point (and underappreciated) on dialog tags' effect on pacing. Related point: where you place the DT (before, splitting, or after) the dialog makes a big difference in timing. IMHO, Robert Parker is the master of varying pace with DT placement. In particular, he uses this tool to create perfect scene and chapter closers. What gets me is when people start making lists of all the dialogue tags they can come up to replace said and proudly display it as if it's a major accomplishment. Seems like there are better things to do than make lists of dialogue tags (like write the book). For me, I just use whatever comes to mind first when I'm writing the dialogue. It's not a big list--think I could count it on one hand. Thanks for addressing my question on your blog, Jessica--and for shortening my email! I've been in the said-only camp for a very long time, but I can't help but notice that a lot of published books use adverbs along with other dialog tags. A random sample of current bestsellers on Amazon (The Shack by William P. Young, The Host by Stephanie Myer, The Brief Wondrous Life of Oscar Wao by Junot Díaz) show lots of highly descriptive dialog tags along with adverbs. A single page of Anne Perry's The Shifting Tide published in 2005 shows: "she said raspingly," "Flo retorted" (Flo retorts on the next page, too), "Ruth said icily," and "Hester raised her voice sharply." These make a lot of writers (me included) roll our eyes, but that's not stopping Anne Perry from selling a bazillion books a year. Do we cringe because they're bad or is it because we've been conditioned to hate them? And if they're so bad, why isn't it stopping agents from shopping and publishers from publishing? I probably debate this subject while I'm writing more than any other aspect. Do I need a tag? Beginning, middle, or end of the dialogue? Is there expression going on that really needs to be shown here to convey some emotion? Admittedly, a lot of the time, it's really just to make sure the reader knows who is speaking if it isn't clear. If it is clear and the emotion or point of the dialogue can be conveyed in words only, then why use a tag? It's difficult. I have certainly been told countless times to limit tags, to use 'said' more often than not. For me though, as pointed out by several others here, pacing/flow is the biggest thing. I reread a lot as I go along, and edit out or in the tags I think benefit how the dialogue reads. Like all things in writing, it really just depends. Only use said, no adverbs…blah! Campy romance novels may be responsible for purple prose and overwrought, “he snarled angrily” style writing, but I swear Elmore Leonard’s 10 Rules created droves of paint-by-numbers, bland writers. Not using tags or adverbs is a style, not writing canon. IMO, adverbs and dialogue tags are the seasoning in the soup; too much and the soup is inedible, too little and it’s tasteless and unappetizing. Everything in moderation works BOTH ways. In opposition to those who commented otherwise, my main peeve is using said to tag a question. "What is the sense in that? ", Richard asked. Otherwise, the tags should be unobtrusive. Has anyone considered boldly taking a new and different approach to writing dialog and attribution? But, invariably, I would find myself at the height of a series of exchanges between characters only to be slapped cold in the face by the unforgivable traditional dialog tagging - the "he said", "she said" thing. I promised myself back then that should I ever decide to write a story I would NEVER follow the crowd and use such a flawed method of tagging dialog. To identify a character after he speaks is not only unnecessary, but, IMHO, wrong-headed. Happened to me as recently as last night. I just got a copy of The Tale of Despereaux - research for a writing project - and experienced the same jarring stumbles several times within the first ten pages. A quote is introduced after one character has spoken, and only after the quote is given do I then find that (1) the words belong to an unexpected new character, and not only is the voice I've been hearing as I read wrong, the emotion/mood he's speaking in is wrong, too. And my jarring stumbles are now internal! I'm not reading out loud. How about if tagging and attribution were done this way? When Kayla saw it she quickly rose from her chair, grabbed the fork, and hid it and its treasure behind her back. Kayla didn’t think that Maq had seen the piece, but there were quick exchanges of tense whispers between the girls, and Maq could only wait silently for the disruption to end. The girls took their seats again, sulking from their brief whispered argument. Maq gave Kayla a long hard stare, before continuing. “Of the Possum, the only thing I learned was that Stenge and the other Rat soldier had a runnin’ argument over some ‘sliver’ pieces – but I think he mean silver. The Possum had the silver and the two soldiers were after him ta get it back. But if they could capture you girls and the Possum, that would bring extra praise from their superiors to the Rat who did so. Stenge couldn’t say why you two were out here so far from your home. And he didn’t know why the Possum was followin’ you. But I did learn that the Possum was hired by the soldiers ta spy on the town. “I felt I had learned all I could from the Rat, so I let him go. He asked if he could get some things before he left - he said he had to. He couldn’t go back ta his superiors without them. I dinna see any harm, since he only took some sandals and a coat. “When he came back with his items I reached ma arm around his shoulder and led him outside. Then I handed his sword back ta him and said, ‘Now go! And remember, I’ll be followin’ you - for years ta come, even. So keep an eye out for me, ‘cause I’ll certainly keep an eye out for you.’ I just had ta add some more ta ma story, so I said, ‘Oh, and by the way, soldier, I think you must have the wrong idea about the Kag monster. You seem to think there’s just one of us - me. Well, guess what? We are many. There are more to the Kag monster than you can imagine. Then I made a lot of eatin’ noises and I rubbed ma stomach. His pants turned wet. Then he shrieked and ran for his dog. They were out of sight in seconds. “On my way back to ma woods I found Snowflake waitin’ for me on the edge of town, so I climbed onto her back and we headed back ta the campsite where this all started. I scouted around for a bit and decided the Possum must have headed west, though I dunna know why. I guess he was still wantin’ ta follow you two. Anyway, I was dead tired so Snowflake and I bedded down there in the alcove and slept. “When I awoke this morning I continued ta follow the Possum’s trail until I lost it. I wouldn’t worry about it, though. He could end up followin’ the road west for weeks, or even longer. Kayla shaded her eyes with her hand and sank down in her chair. She couldn’t think of any way out of this one so she braced herself for the consequences. Maq grew quiet for a moment. Annabelle smiled, fluttered her eyes, and plucked a leaf fragment from his ear and waited for his reply. The three now grew quiet. Annabelle immediately regretted her behavior and pulled away staring down at her lap. While her face remained downcast, her eyes glanced up to see Kayla staring back and slowly shaking her head in shame and disapproval. Kayla had to fix things between them right away, so before he left the doorway, she hastily announced that she would begin working on supper. Product of too many creative writing classes and writing weekends at plush resorts it seems. Read Rowling . . . tags your arse off. And it doesn't matter -- at least not to sales eh? To Each His Own . . . Does Ageism Exist in Publishing?